We are constantly looking for a snack or light lunch that doesn't contain bread, crackers, etc. Don't get me wrong we love that stuff, but it seems we eat bread at just about every meal. These were a perfect fit and so easy to prepare. Plus they offer a great way to rid yourself of leftover fish. You can easily substitute water packed canned tuna for the fresh fish if you wish. 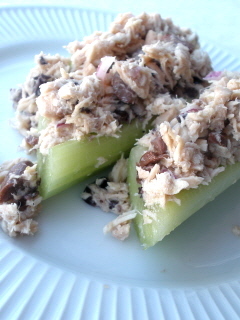 Combine all ingredients except celery in a small mixing bowl, flaking fish with a fork. Once combined refrigerate in an air tight container for at least 30 minutes to combine flavors. Add fish filling to celery and cut into 3" length, cutting at a diagonal. Serve immediately.